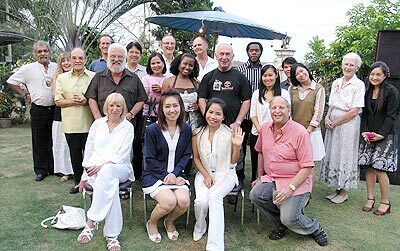 The March meeting of the Chiang Mai Friends Group was held at the premises of ‘Track of the Tiger,’ a beautiful house and garden owned by the innovative Shane Beary, another of whose stunning and ecologically sound projects, Pang Soong Lodge and Outdoor Education Centre, was the subject of a recent and very favourable review in this paper. Admittedly a little difficult to locate (one new Friend whose favoured means of transport was by songthaew, reported that even the local driver got lost several times) the peace and quiet of the countryside was a welcome relief. A total of 9 ’first-time’ guests enjoyed meeting new people and hearing first-hand experiences of CMF’s activities; the rest of us enjoyed catching up with old friends before dinner. One of the project’s main aims is to support and encourage friendship between farangs and local people by means of the ‘One Visitor – One Tree’ events, which take place in Ban Papai, a self-sufficiency village in Doi Saket district. Each visitor plants, in a local garden and in friendship, one sapling, which will be watered and taken care of by the garden’s owner. Because the little tree was planted as a symbol of friendship, it will not be cut down or allowed to wither and die. The planting events will continue all year. The event, which took place on April 1, is reviewed elsewhere in this week’s paper. The village itself is set in beautiful countryside, close to the hills and next to a large klong, full of sparkling water. What drought? Boong reported that the Saraphi Women’s Group are now designing and making products for sale from recycled grass, wire and unused fabric, thus transforming waste into value and reducing burning. Shane then introduced his new programme, ‘Eco-Logical,’ which aims to encourage responsible tourism and to promote education and environmental protection. The project has already been trialled in Ban Pan Soong. Shane invited CMF member to visit the village and see how local people were able, as a result, to earn money from tourism without harming their precious forest location. Boong announced that the municipality is inviting CMF members to volunteer as helpers, mostly in the ‘polite zones,’ during the upcoming Songkran Festival. A member of Chiang Mai’s Urban Development Institute Foundation (UDIF) gave information about the UDIF’s petition, organised to request urgent action on the city’s pollution problems. As many signatures as possible are requested; the petition will be presented separately to PM Abhisit Vejjajiva and to the new Chiang Mai governor. A long-standing CMF member, Elizabeth Spring, presented an interesting idea by suggesting that those of us who love Chiang Mai should wear a bright orange ribbon (please note, not red and not yellow) to signify that love, and that we should explain why we are wearing it to all who ask! Khomsan, the formal presentation given by the speaker, ably assisted in translation by Joe, gave a great deal of informative advice about Thailand’s labour regulations, including work permits, company formation and the link of a work permit to a work visa. Somewhat complicated, but, here in Thailand, what isn’t? Guest speaker Dr. Chris Moretti (centre) with president Pakin Ployphicha (4th left), secretary Sutthiruk Sitthisoonthorn (3rd right) and vice-president Ben Wongthong (right). The newly formed Lanna Spa Association held its first meeting, entitled ‘SpaRty,’ at the Four Seasons Resort on March 27, attended by 40 guests representing a number of Chiang Mai spas. Guests dressed in white and gathered at the resort’s cooking school for soft drinks, coffee, tea and healthy snacks. The aim of the new association is to unite and to work together to promote spas in Chiang Mai, hopefully improving the city’s tourism potential as a result, in addition improving the revenues of the spas themselves. Members are committed to training their staff to a high professional standard, thus improving the image of the city’s many spas. Pakin Ployphicha, Oasis Spa president, is heading up the association, with Ben Wonghtong as his vice-president and Sutthiruk Sitthisoonthorn as secretary. The guest speaker at the inaugural meeting was Dr. Christian Moretti PhD, a chemist-bio-scientist from Aberdeen University, who presented an extremely informative talk on Essential Oils and Aromatherapy, explaining that aromatherapy is the practice of using specific essential oils (complex products containing many different components) to alleviate physical, emotional and mental symptoms. The therapy is viewed by its practitioners as a natural alternative to traditional medical treatments. True aromatherapy uses essential oils derived from herbs and plants, ranging from Lemon Grass, used for headaches, sore throats and respiration (surely a must for residents of Chiang Mai in recent months…) to Jasmine, used for depression, anxiety and other similar conditions. For memory loss and fatigue, Rosemary is recommended; for nervous or sexual debility, White Orchid may be prescribed. The lists of ailments and their remedies are almost endless. Aromatherapy originated in France 70 years ago as a result of an accident Rene Gattefossé, a chemist, burned his hand quite badly, and, seeking relief from the pain, plunged it into a container of pure lavender oil. To his amazement, the pain and discolouration faded almost immediately, and the burns healed a few hours later! The techniques Gattefossé and his colleagues subsequently established are still in use today, and the popularity of aromatherapy continues to increase as more people seek natural alternatives to conventional medicine. Dr. Christian also explained that essential oils and essences are highly concentrated substances extracted from various parts of aromatic plants and trees. They are usually captured by steam distillation, a process whose origins can be traced back to ancient Mesopotamia, and must be diluted with an inert vegetable oil or with water as they are volatile and flammable. He discussed many other aspects of aromatherapy, including quality control and the mixing of different essential oils, warning against mixing oils which contain incompatible components, which causes a chemical reaction resulting in the degrading of the mixture. He also explained that, as there are divided opinions amongst professional aromatherapy practitioners concerning the use of essential oils during pregnancy ;it may be better to avoid their use. A very long, interesting and complex talk with guests being provided with a hard copy to study at their leisure! The next meeting of the Lanna Spa Association will be held at the Tamarind Village, on April 24; with a focus on ‘Going Green’ – another interesting and topical subject in the current climate. Natthapas Yot-arlai, GM Angkhang Nature Resort; Punyaporn Pradubsule Asst. Director TAT Chiang Mai Office; Suthat Pleumpanya Director of Highland Research & Development Institute Royal Project; and Warunee Exe, Asst. Manager Amari Rincome Hotel join event organizer Ongkarn Chaiongkarn MD of Man Muang Chamber Co. Ltd., at the press party. Last Thursday, the rooftop suite at the Amari Rincome saw the press party to launch the 13th annual Rincome-Angkhan Family Rally 2009, which will take place on May 9 and 10. The party, including entertainment and a delicious dinner, was led by Natthapas Yot-arlai, GM of the Angkhang Nature Resort, which will host competitors for an overnight stay, and, in the absence of the Amari’s GM, Wim Fagel, his assistant manager, Warenee Exe. The guest of honour was Suthat Pleumpanya, director of the Highland Research & Development Institute’s Royal Project. The rally event will cover the full weekend, including the overnight stay at the resort, and will begin at the Amari Rincome Hotel. The route to the resort normally takes around 3 hours; however, for contestants there will be many fascinating and fun diversions, games, and ‘tricks and turns’ to occupy their time! The route will take them through some stunning scenery, with plenty of chances to enjoy the natural beauty of this picturesque region. Last year’s winners were Phakphoum Diewtrakul and Chairat Roosue, who were awarded the Prince Bhesadej Rachanee Trophy, 5,000 baht cash and a Samsung camera with which to record their future adventures. So far, this year, there are 30 entrants, with the rally’s organisers hoping to top last year’s total of 49 vehicles and 180 guests. Prizes this year include a 2-person round trip air ticket for either Chiang Mai – Pai or Chiang Mai – Chiang Rai, donated by rally sponsors SGA Airlines. Anyone who wishes to join the rally, at a cost of 3,950 baht for 2 persons, including the overnight stay at the resort, plus breakfast, lunch and dinner, please contact 053-221-130 or email on sales @rincome-amari.com. Sounds like fun and a bargain! A new website was launched by the British Council in Chiang Mai on March 27, aimed at giving expanded information to students wishing to continue their education in the UK. The site www.britishcouncil.org/thailand-educationuk.htm contains updated news on choosing courses, university prospectuses, course websites, information on study visas and scholarships, transnational education (UK distance learning qualifications) and links to a large number of relevant and informative websites. Mansit Thind and Supattra Honghirun at the launch with prospective UK students. Supattra Honghirun, British Council representative, explained that it is essential for prospective overseas students to be given accurate details on available courses and visa requirements, together with an overview of Western culture which will assist students in dealing with ‘culture shock’ when they arrive in the UK. As the British Ambassador stated on his recent visit to Chiang Mai, of 45,000 visa applications received by the embassy, 40,000 are granted, many of which are for study purposes, indicating that the UK is open for business, for investment, and especially for further education. A reception was held at the Shangri-La Hotel in honour of the recent visit of H.E. Paul Grigson, Australian Ambassador to Thailand, to Chiang Mai to meet with the Chiang Mai governor and the city’s mayor. Australia’s ties with Thailand focus strongly on further education, with a large number of young Thais choosing Australian universities as a destination to continue their studies. The Australian Embassy is involved in developing government-to-government relations, including working on bilateral education reform projects in Thailand and supporting multilateral engagements to advance Australia’s position on education and related issues. Earlier this year, 15 distinguished Thai scholars and professionals were selected as winners of the Australian Government’s internationally competitive, merit-based Endeavour Award scholarship programme. The Embassy also supports a Cultural Relations Programme, which showcases artistic events and cultural assets of Australia’s foreign and trade policy objectives. The recent visit to Chiang Mai of Logic, the Australian jazz band was organised in co-operation between the Australian Embassy and the dusit D2 Hotel.